I don’t do many product reviews here but thought it was time for one. 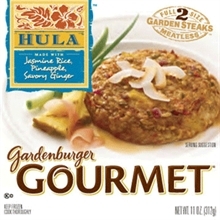 I have been eying GardenBurger’s Gourmet GardenSteaks for awhile now and decided to give them a shot. At $5.99 for two it wasn’t an easy choice but I thought maybe they’re worth it. Now anyone who reads this blog or know me otherwise knows veggie burgers are my junk food. I usually down two of them once, sometimes twice if I’m feeling edgy, a week. Served up with a heaping side of tater tots or a couple baked potatoes they are quite pleasing. 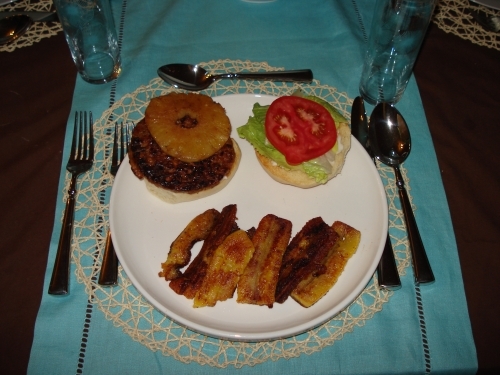 I decided to go along with the tropical vibe the box said I would encounter with these particular patties I would have a fried plantain with them and since I had a fesh pineapple handy that was in need of being devoured I should cook up a couple slices of it along side as well. These are pretty hefty patties and I thought twice about having both but decided to not go hungry and threw both in the pan along with a slice of pineapple for each. I am not a directions follower, that “cook 6 minutes each side and serve” crap is worthless. Good things come to those who wait and I cook a veggie burger for no less than 45 minutes, on low, flipping about every 5 minutes. I know you may think that’s burning them but no, that’s getting some amazing flavor from a patty. I would be changing nothing in my cooking regiment with these. I brought them to a good sizzle, turned down the heat to low and checked back every few minutes. I served them up with the aforementioned plantain and on two fresh, homemade buns with lettuce and tomato. They have a good texture and aren’t very mushy. I could taste the chunks of ginger and noticed large flakes of coconut. I did, however, find them to be a bit on the sweet side and decided to forgo the sliced pineapple since it lent only more sweetness. Still, a bit sweet for me as a veggie burger. If I did try these again I would add a bit of heat with some peppers instead of the pineapple slices and use mustard instead of the Vegenaise I typically use. Two of these at a time are a bit much but I toughed my way through them both, and the fried plantain, which is always a tasty treat. Next time I’ll be spreading the box over a couple nights. I saw two other varieties when I bought these, a black bean and a Tuscan flavor. The Tuscan is not vegan, the Hula is. I am unsure about the veganess of the Black Bean variety but if it is it will be tried next. Previous Entry: What Rock Did They Crawl Out From Under? Next Entry: How Does My Garden Grow? I bought them at Whole Foods but they may be available at Kroger or Publix. They’re discontinued now. Like every good vegetarian thing. UGH. Gardenburger is also now owned by Kelloggs. What doesn’t sell quick is likely to end up on the discontinued list too. FYI – I found some at Ralph’s! After not having for the past 6-10 months my roommate came to me this last Sunday with 6 boxes! Going to start going back to stop up! Check your local Ralphs! Previous Entry What Rock Did They Crawl Out From Under? Next Entry How Does My Garden Grow?